Tonight after work I went to the Wal-Mart to get me a pair of running sweat pants. I headed straight for the $5 rack in hopes to find some cheap ones to run in. The women's rack didn't have any so I tried on a pair of regular price pants. They looked cute on the hanger but once I tried them on they were so tight I couldn't move. So I moved over to the men's clearance section. I found a pair of pants and hope that I am brave enough to wear them. 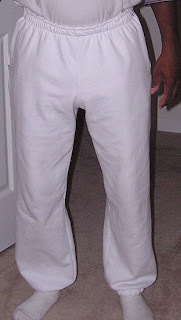 I came out of the store with a beautiful pair of white wind/sweat pants! Yes white! I don't own regular white pants much less sweat pants. This is a fashion statement I cant wait to make. I never match while working out but this may be pushing it even for me. Wonder why those had made it to the clearance rack???? Clearance...who knows. By the way both of yall need to read my post this morning....the pants got stained!